White Tea is picked and left to dry/wither, stopping the oxidation. This gives white tea a more delicate taste than other teas and we prefer to blend white tea with beautiful flavors that complement its’ delicacy. We are not ‘tea snobs’ in regard to feeling the need to abstain from additions to certain teas..we are complete and unapologetic ‘tea TASTE snobs’, however. Our white tea blends are delicious without being crude or rude to the tea; in fact, they only enhance the beauty. Like all teas, white tea has been shown in studies to have beneficial health properties and is rich in antioxidants. Brewing: We recommend brewing white tea at 170-175F for 2-3 minutes, to taste preference. The blend is a knock-out. 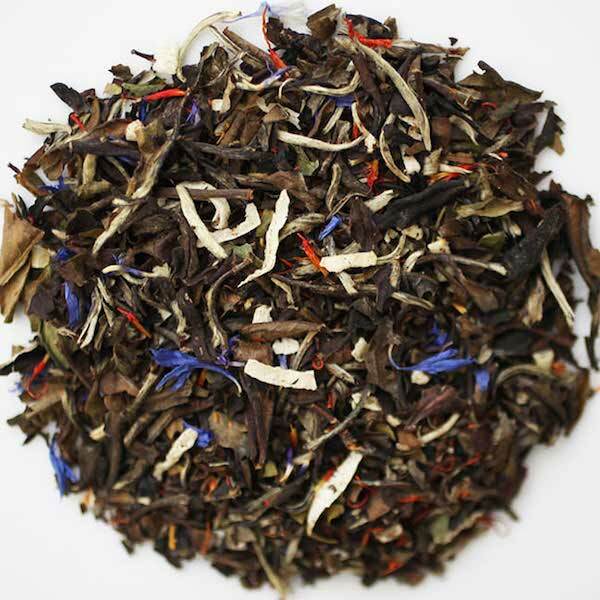 A delicious and delicate combination of white tea and raw coconut. After infusion, a golden liquid with notes of warmth and comfort–the coconut doesn’t dominate..just hints. Serving Suggestion: Wonderful hot or iced and especially nice if raw sugar is the sweetener, should you feel the need. 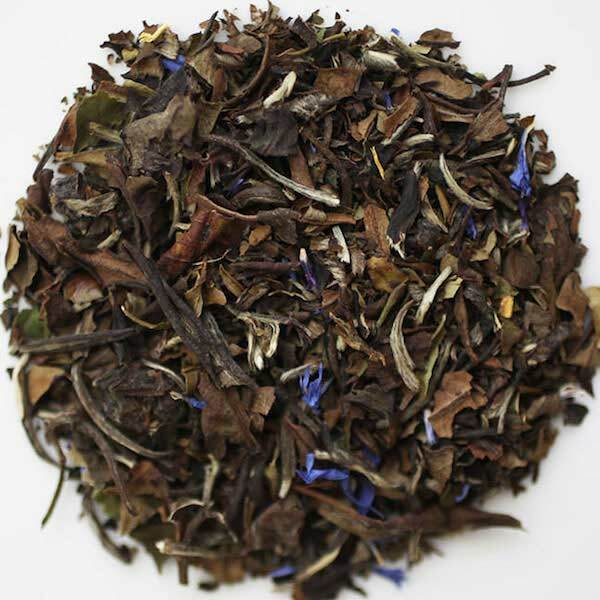 Real blueberries and a hint of pomegranate enhance, but never overpower, this delicate white tea. If you’ve had tasteless white tea and thought you didn’t like white…you’re in for a real treat. Serving Suggestion: Serve hot or iced, with or without sweetener. Brewing Instructions: Use 1 heaping tsp. to 1 tbs. per 8 oz. water, to taste. Steep a full 3 minutes at 170-175F NOTE: Always stir blends before infusing to get an even distribution of the ingredients for consistency.